Honeywell and Hawaiian Electric plan out fast demand response program to balance wind power ups and downs. Can the right combination of technology and economic incentives get utility customers to turn down megawatts of power use fast enough to balance wind power’s ups and downs? Honeywell and Hawaiian Electric Co. (HECO) are going to try it out on the island of Oahu, using Honeywell’s automated demand response technology. Under the two-year pilot announced Thursday, HECO plans to offer customers lucrative incentives to turn over their power loads -- factory motors and process lines, lights, air conditioners and the like -- to allow them to be turned down within 10 minutes' notice. Honeywell will connect the utility to customers with its Akuacom demand response servers, which use a standard called OpenADR. It also will install its Tridium smart grid controllers at buildings to translate power-down signals into commands within the buildings. All told, the project is targeting 7 megawatts of power-down capacity, Jeremy Eaton, Honeywell’s vice president of smart grid solutions, said in an interview. 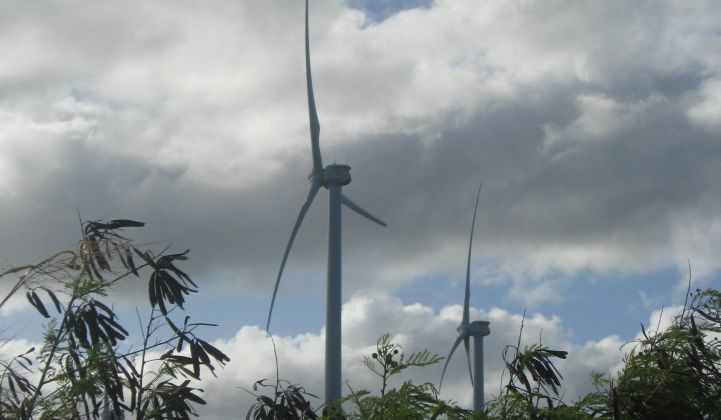 Honeywell’s been doing automated demand response projects like these for some time in California, Florida, the United Kingdom and China, but the Oahu project is its first specifically linked to balancing wind power, Eaton said. That requires a much faster response time than traditional day-ahead or hour-ahead demand response programs. It will also require close coordination with the utility and its systems for communicating with the wind farms that connect to its grid. First Wind operates a 30-megawatt wind farm on Oahu's North Shore, and it is backed up by a 10-megawatt-hour, 15-megawatt battery system from Lyle, Texas-based startup Xtreme Power, designed to smooth power flow onto the grid. All of that integration work lies in the future, Eaton said. Right now, Honeywell is working with HECO to identify customers and start putting its technology in place. The utility is offering a $5 per kilowatt payment just for signing up, much like the so-called capacity payments paid to traditional demand response participants today, as well as 50 cents per kilowatt-hour for the up to 80 hours per year they may actually be powered down. Wind power’s fluctuations are easier to balance out on the mainland, where utilities can tap regional power reserves like natural gas-fired peaker plants to help manage the ups and downs. But Oahu gets the lion’s share of its power from burning imported diesel fuel, which makes balancing power expensive and hard to come by -- thus justifying the high prices HECO is willing to pay participants in the new program. Hawaii also has a goal of getting 70 percent of its power from renewable resources by 2030, and while some of that can come from stable geothermal or biomass resources, a lot of it will come from intermittent wind and solar power. This isn’t the only project aimed at balancing wind power with demand response. EnerNOC has been working with the Bonneville Power Administration on a stimulus-funded project aimed at matching the region’s growing share of wind power with big power customers like cold storage facilities. The country’s biggest demand response aggregator wants to automate much of that process, both with its in-house technology and with other companies, utilities and agencies using the OpenADR standard. That’s the technology that Honeywell’s Akuacom servers use, but we’re seeing more companies build equipment to use the open-source technology, given that it’s being adopted by federal regulators as a smart grid standard. Some demand response systems are aiming at even faster power-down speeds. In November, startups Viridity Energy and Enbala launched smaller-scale projects aimed at responding in seconds to play into frequency regulation markets for Mid-Atlantic grid operator PJM.